As we said good bye to Rome, we were happy to move onto a new adventure, The Amalifi Coast of Italy! 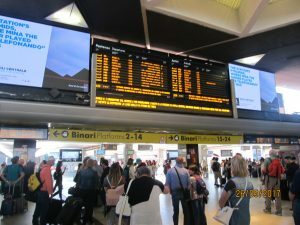 We had a train booked out of Rome Termini around noon to Naples! We booked this train before we left home. 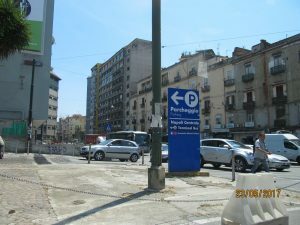 Donald Trump was on the loose to visit the Pope, so we had to allow for the traffic jams this would cause this morning! We had arranged for a car to transport us to Rome Termini which was a bit more expensive than a cab but much more reliable! So it was a bit of a sleep in, as we didn’t have to get before 9:00 AM. We had some time to get an in room coffee, the tea was horrible though for me! Hubby enjoyed his coffee and there were some pastries which were too very sweet to eat, we tasted but couldn’t eat them and the juices looked very sweet, so we tried them but couldn’t drink them either! I guess if you have a sweet tooth then this would be for you! I sometimes just love a Diet Coke in the morning which is not too sweet, but does give you that little zing you need to get on with the day! I guess I’m just a weird morning person! 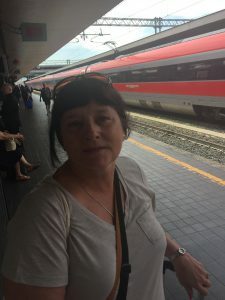 We were picked up at around 10:00 AM and we were at Rome Termini before 10:45 AM, so we had lots of time to hang around before we caught the train to Naples! One thing I have to say about these large train stations in Europe is that they don’t have many or should I say any places for people to sit while they have to wait for trains! Every spot imaginable was gone, the floor was the only place to sit and even then there was not much open floor to sit on! Dismal when you are older and find it difficult to get up off a floor! There were lots and lots of security because of Donald Trump and so many other world leaders in Rome in advance of the G8 Summit in Sicily! So much so that the Italian Police closed off an entire section of the train station to the public, which meant even less space to mingle and wait for the trains! Boarding the Fast Train To Naples! Rome Termini is the second largest railway Station in Europe after Paris Gare Du Nord, with 150 million passengers passing through each year! The lower level facing the tracks is like a shopping mall and the upper level has several restaurants. We headed to the Upper Level with time to spare and we had a beer and a small sandwich each! It was good but expensive, however, we did have a place to sit and not stand up for most of the time we were there! Our train was scheduled for departure for 11:53 AM! Trains depart to Naples every 20 minutes. 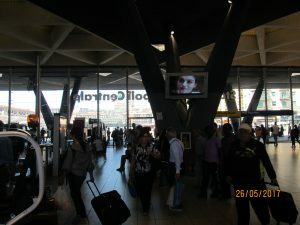 We were booked on the high speed Frecciarossa and arriving at Napoli Centrale at 13:02! 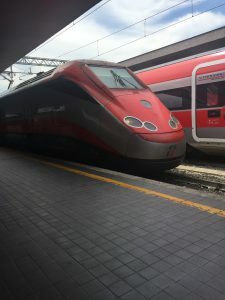 We booked our tickets in Business Class for $40.00 each Canadian which gave us our own compartment with facing seats which was a very nice way to travel and observe the Italian countryside! 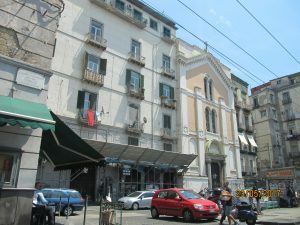 We arrived Naples at around 1:00 PM on time and met our previously booked driver and car to The Almafi Coast at a cost of 100 Euros!.We had booked a well known tour company which Hubby had researched online the Benvenuto Drivers. Very relaible and very conscientous. 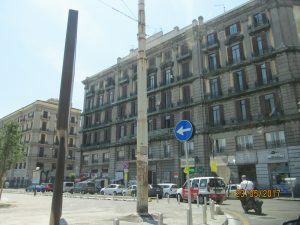 This is the fastest and most convenient way to get from Naples down to The Almafi Coast. 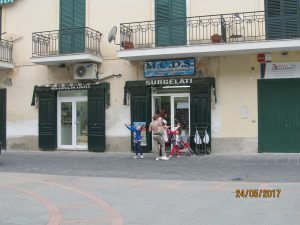 We had a hotel booked in the small town of Maiori and our time to arrive was about 70 minutes! 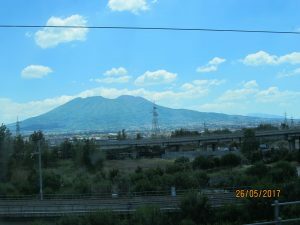 Naples has a metro population of over 8 million people which is close to the populations of Rome and Milan. Our car with Benvenuto Drivers was a Mercedes, very comfortable and large! The driver was an older man and spoke a little English. Our route, after negotiating meandering and very narrow streets of Naples, which I must say is quite chaotic. Everyone is in a big hurry and very aggressive, honking horns, rude drivers crisscrossing around each other, really just like in the movies! A bit intimidating but our driver was very skillful and resourceful! 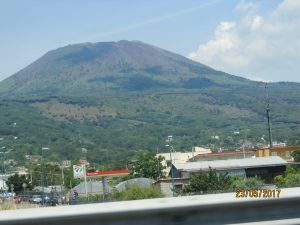 He took us past the still very active Volcano at Vesuvius on the left. If you want you can tour the ruins of Pompeii which was buried by the 79 AD eruption of Mount Vesuvius! We decided to pass as we knew that it would be a very long day if we had to add on a three hour stop over! 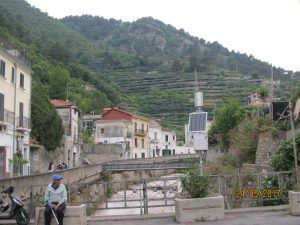 Our drive got interesting when we reached Salerno as we had to navigate the narrow coastal road up to Maiori. 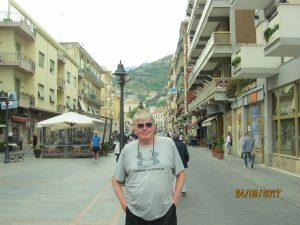 As a side note about Salerno, this is the place that was the focal point of the invasion of Italy in 1943 by the Allied forces! Many Newfoundlanders fought under the British Flag in the bloody battles around Salerno! 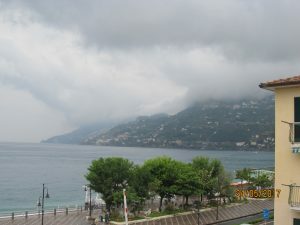 The Amalfi Coast is a stretch of coastline approximately 40 kilometres long around Strada Statale 163 between Vietri Sul Mare up to Positano. 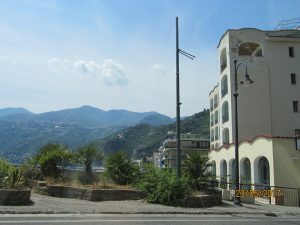 There are thirteen towns on The Amalfi Coast which is a very popular tourism destination. 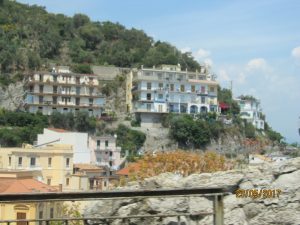 The scenery is absolutely amazing, with so very many steep cliffs descending to the ocean, with very colourful houses clinging to the rocks, and with always little beaches on the shoreline! 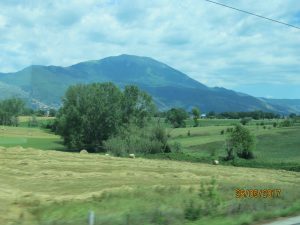 This area of Italy is one of the most beautiful places we have seen on our travels of the world so far! Our driver was nice enough and stopped a few times for us to take some beautiful pictures even though you had to be tucked away in a crevice of the side of the road so you wouldn’t get run down! 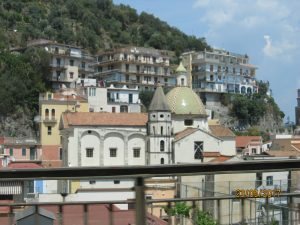 Lots of traffic on this little and very narrow highway onto The Amalfi Coast! 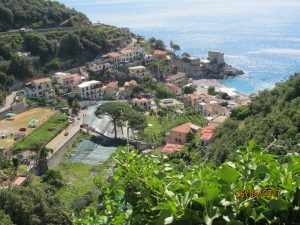 The recently made movie Wonder Woman was filmed partly on The Amalfi Coast, as was the movie Under the Tuscan Sun! 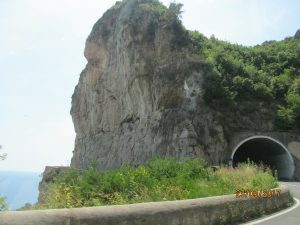 The Narrow Winding Roads and Tunnels towards Maiori and Almalfi! 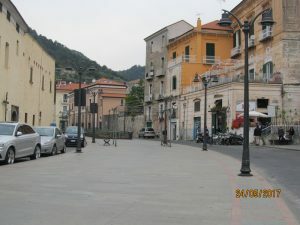 Maiori is a nice little town with a population of around 5700. There are lots of hotels here and so everything revolves around tourism. 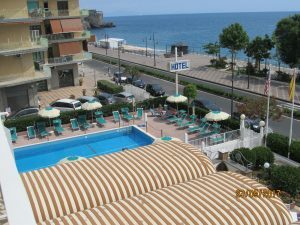 Our hotel was Pietra Di Luna which was located across from the beach, but considered oceanfront! Our room rate was 165.00 Euros per night which is quite expensive by Canadian standards! But hey on The Amalfi Coast nothing is cheap! We would be here once and perhaps never again, so had to see this place we had heard so much about! 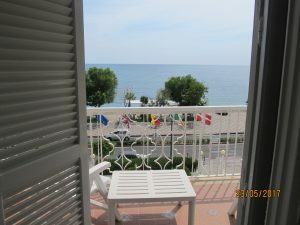 We did have a room fronting on the ocean side which was ok. The views were spectacular from the patio which overlooked the street and the ocean! The room was very basic and barren though! A big closet, a basic bathroom, two double beds which were like rocks and by the time our three nights were over, I was ready to get out of there. The beds were brutal on the back, like you were sleeping on concrete! 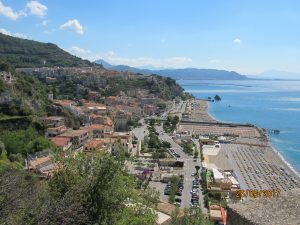 The Views Along The Almalfi Coast! No Wi-Fi in the room, although it was advertised when we booked it that it was available. Don’t believe everything you read about hotels! Wi-Fi was available in the lobby but it was very touch and go! One thing I didn’t like was upon check-in, they made us surrender our passports to the front desk, so they could check them. We were taken to our rooms and told to come back and collect them later! I personally felt this to be very uncomfortable, leaving your passport at a front desk and then collecting them about an hour later. We had asked that they be given back to us quickly but it did take an hour before we were able to retrieve them. Scary I thought! 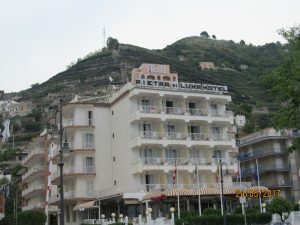 Hotel Pietra Di Luna & View From our Room! Anyways the nicest thing I liked about the room was the balcony which was very nice to observe the beach and the lemon trees growing on the street below. The large balcony offered spectacular views of the coastline in all directions. 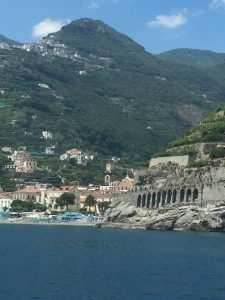 There were lots of passenger boats operating which connected to the various towns up and down The Amalfi Coast. 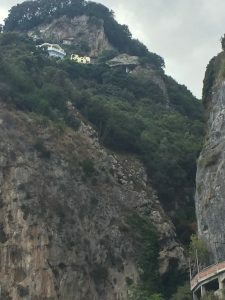 This was a blessing as you did not have to deal with the clogged narrow roads that were filled with cars and the many tour buses that were trying to navigate their way along The Amalfi Coast! 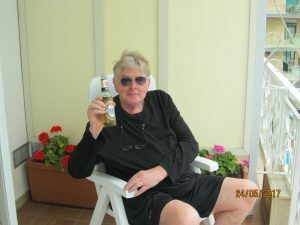 Hubby Enjoying a Much needed Beer on our Patio! 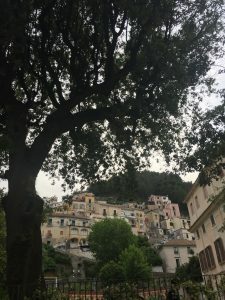 We were booked into Pietre Di Luna for three nights so we could unpack a bit and chill out a bit after the past day or so very frantic activity in Rome! We sat out on the balcony admiring the fabulous views. 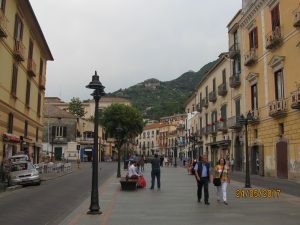 The main street through Maiori ran past the front of the hotel and on the other side between the road and the beach was a fantastic pedestrian boardwalk or bricked roadway which had lots of benches, palm trees, playgrounds for children and direct access to the beaches! There were also many restaurants located on the pedestrian walkway and places to book boat tours out to the islands of The Amalfi Coast! 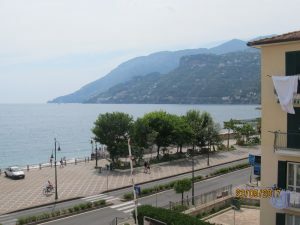 This certainly was a beautiful place for a long walk along the oceanfront and below the walkway was the longest uninterrupted sandy beach on The Amalfi Coast complete with sun beds and parasails! But if you want to sit on the beach you would have to pay the hotel or the restaurants that owned the beach properties! 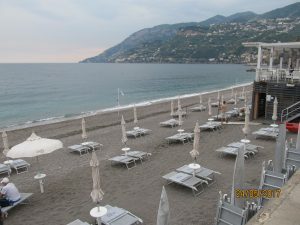 We could have went out and stayed on the beach directly below our hotel as the beachfront was the property of the Pietre Di Luna Hotel, but the weather was not not quite sunbathing weather for us! 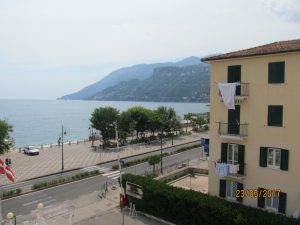 View of the Boardwalk of Maiori From our Hotel Room! We went out for dinner early as we had only had a sandwich at Rome Termini for the entire day before we left. We found a place quite close to our hotel that had lots of snacks, beer, water, soft drinks, wine and some lemons! So we decided to visit this place on the way back from dinner. We found this beautiful little street Piazza Raffaele D’Amato which is a pedestrian street off the main street in Maiori with lots of restaurants, shops, boutiques, and places to buy deadly desserts! As we were walking along, Mario of the Restaurant Mario and Maria convinced us to try his food! He was a persistent bugger and made out like he had the best food in Maiori! He had an outdoor seating area in the middle of the street and his restaurant was in an adjacent building. We told him that we were Mark and Marilyn and he said he Mario and Maria owned the restaurant and she of course was the main cook. Nobody cooks like Maria! So we were hooked! He invited us to tell him what we wanted to eat, and he and Maria would cook it for us! Little Shop near our Hotel and Side View From Our Room! We ordered the antipasto for a starter and a couple of veal dishes that looked pretty good from the menu! I must say we were very happy with the meal for 40 Euros including generous amounts of wine and tip and after a long day it was nice to have something pleasant to eat without having to venture too far from the hotel! 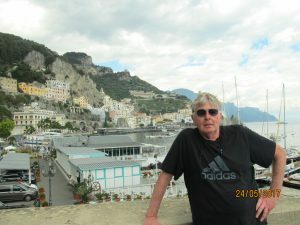 We did find The Amalfi Coast to be very expensive though, much more expensive than Portugal. 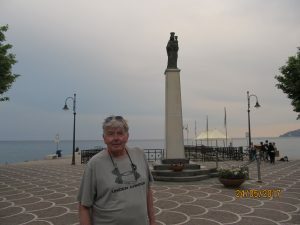 Everything on The Amalfi Coast is really, really expensive! 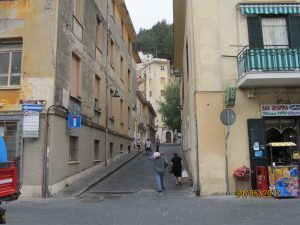 After promising Mario that we would be back for another meal, we walked up the long street towards the steep hill that surrounded the town. We found a few shops that supplied everything we were looking for. The bonus was the Maiori grown lemon. 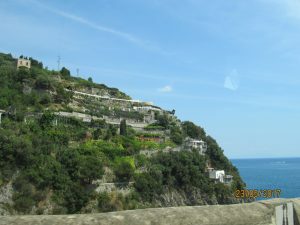 The hillsides feature numerous lemon trees which cling from the cliffs off the beautiful and spectacular Maiori Coast. The lemons are huge and are harvested three times a year. The lemons are a touch more fruity than the ones we get in our supermarkets in Canada and are very delicious in your gin and tonics! On the way back down the street on the other side, we stopped at a very nice bakery to see if we could find a nice sweet to take back to our room for a treat later! This little bakery was family owned, three generations in fact worked in the store. I wasn’t interested at first because the young girl said it was not real cheesecake, but the much older lady inside the counter waved me over and she told me it was better that cheesecake and much lighter, I was sold. So we came back to the hotel with a cheesecake like dessert which I must say was outstanding! No fridge in the room, so trying to keep the other piece good for the next day in the small ice bucket didn’t work! But we did enjoy it immensely! 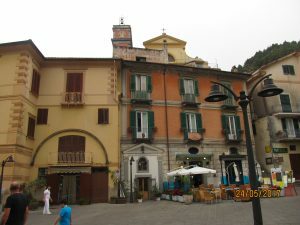 Views Looking up Piazza Raffaele D’Amato: People Live Right Up into the Hills! So out first night on The Amalfi Coast was a great success! We managed to get there safely, had found our hotel, had managed to get find a nice place to have dinner, which was only 10 minutes from the hotel and had successfully had managed to find, gin, tonic and dessert. So it was a great night all round so far! We still had time to sit out on the balcony and watch the sun disappear behind the mountains and watch the fog take over the mountains! We had a very productive and exhausting day so we were looking forward to some down time over the next couple of days on The Amalfi Coast! On our Way Back From Dinner our First Night in Maiori on The Alfalfa Coast! Onto another adventure exploring The Amalfi Coast tomorrow!